Travis Lee Davis escaped jail in Missouri and a police car in Oklahoma while on the run. SEDALIA, Mo. (AP) — Authorities say a kidnapping suspect who escaped from a Missouri jail and an Oklahoma patrol car has been arrested after returning to Missouri. 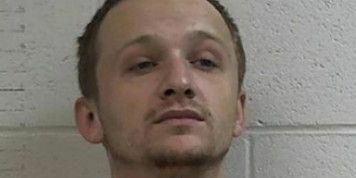 The Sedalia Democrat reports that 30-year-old Travis Lee Davis was found early Tuesday trying to hide in the attic space of a detached garage. Sedalia Police Chief Matt Wirt says he tried to escape before he was arrested. Davis has been missing from Sedalia since escaping from the Pettis County Jail on March 9. He was recaptured last Wednesday in Heavener, Oklahoma. But police say he was able to escape from a patrol car by crawling into the front seat while handcuffed. He drove the car about 1.5 miles (2.4 kilometers) before crashing. Police suspect he later stole a pickup truck and drove back to Missouri.